Your aging parent may love gardening; maybe you even had a family garden growing up. But just because they’re getting older and may not be as active as they once were, doesn’t mean they can’t get down and dirty in the soil. And not only with gardening, but by composting along with it. 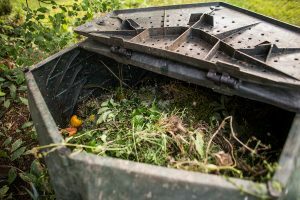 For anyone interested in sustainability and being more green, composting is about as green as it gets, using food scraps and yard waste—such as egg shells, banana peels, lettuce or grass clippings—to help the soil in your garden or flower bed. Not only do those things serve as natural fertilizers, but composting keeps them out of landfills. By suggesting composting be part of your senior care plan it’s a great way to encourage your loved one to think about their impact on the world around them and get them more active. It’s also another way of spending quality time together outside of the normal care activities. Composting can be something as simple as having a stack of leaves in their yard, or as complex as compost bins that are turned daily. It really just depends how what is easiest and works best for your loved one. Bins don’t have to be expensive either. They can be as easily constructed as using a trash can with holes punched in the side and bottom. Compost materials are made up of properly balanced browns and greens. Browns are bulk materials such as dried leaves, dried lawn clippings, straw, hay, sawdust, shredded paper, paper towels, hair, pet fur, egg shells, and nut shells. In order to discourage pests and ensure proper breakdown of the materials, browns should be placed on top of the bin, or whatever the compost material is being kept in. Meanwhile, the greens are high-nutrient materials that break down quickly, and they include tea bags and leaves, vegetables, fruits, coffee grounds, fresh lawn clippings, plant trimmings, used coffee filters, houseplants, discarded pumpkins, and any wet paper products. Keep your compost materials warm, ideally between 120 and 160-degrees Fahrenheit. Keeping it in a place container in direct sunlight is the best way to maintain that temperature. By turning the compost materials at regular intervals helps oxidize the material which helps encourage decomposition. When it has turned into a dark soil with no sign of the individual components originally put in, your compost is ready to use in your garden or flower bed. If your loved one doesn’t have much of a yard or lives in an apartment, they could even use part of a counter top for their composting. The compost pile doesn’t have to be big for it to work. As with many things in life, it’s the quality rather than the quantity. There are many sites online that can offer you and your loved one very specific details about how to compost. These are just a few of the basics to help get started. Another source is below. If you or an aging loved one are considering senior care in Holmdel Township, NJ, please contact the caring staff at Lares Home Care 1-800-781-7435 or 732-566-1112.